Luminar CTO Jason Eichenholz addresses the crowd during his presentation, Lighting The Path To Autonomous Mobility, at Photonics West 2018. Autonomous mobility’s progress has been achieved in fits and starts, though the past few years have seen (*ahem*) accelerated development in its enabling technologies. The U.S.’ Defense Advanced Research Projects Agency is largely responsible for reinvigorating interest in the idea, pitting autonomous vehicle teams against one another in the 2005 DARPA Grand Challenge and the 2007 DARPA Urban Challenge (fun fact: 12 years later, Carnegie Mellon University figured out why its H1ghlander Humvee — a favorite to win the 2005 competition — didn’t take first place). Luminar embraced the opportunity to advance self-driving technology, developing the Model-G 3D LiDAR system, which took home a 2018 Prism award (Imaging and Cameras category) at Photonics West 2018. Additionally, Eichenholz helmed the presentation Lighting The Path To Autonomous Mobility at the exhibition. Level 1: Feet off — This level of autonomy has been established since the advent of cruise control. Level 2: Hands off — This means the vehicle will track properly and stay in its lane. Resolution — 64 lines, with millions of points per second, at 10 Hz, is the “fundamental resolution” needed to move autonomous driving forward in earnest. Wavelength — Luminar’s system operates in the 1550 nm “eye-safe” range, wherein light safely allows 17 times the photon budget, but also requires InGaAs as a detector material. Luminar’s system utilizes a new Si-InGaAs hybrid ASIC. Architecture — Linear detector operation which is less susceptible to interference than PIN or Geiger-mode avalanche photodiode (GmAPD) , stated Eichenholz. Field coverage — Scanning allows isolation against interference better than flash, Eichenholz said. 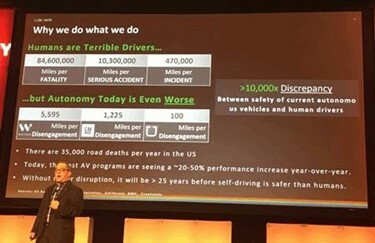 Fortunately for Eichenholz and others trying to make their mark in autonomous driving systems, there was no shortage of vendors at Photonics West willing and able to cater to their needs; the market for autonomous vehicles may not yet be thriving, but demand for the enabling technologies — capable of use in a variety of applications, including factory automation and telecommunications — is skyrocketing. “Interest in [these technologies] is enormous. It’s an order of magnitude greater than last year. I think it’s because the industry is sensing that it’s becoming more reality – prototypes have been demonstrated, investors are engaged, so these tend to be well-funded companies that are coming to us with funding, willing to assist in development in these new products,” said John Goings, an account manager for Lasertel. Lasertel manufactures edge-emitting laser diodes, and for the last few years they’ve had development effort to do vertical cavity (vixel) arrays. 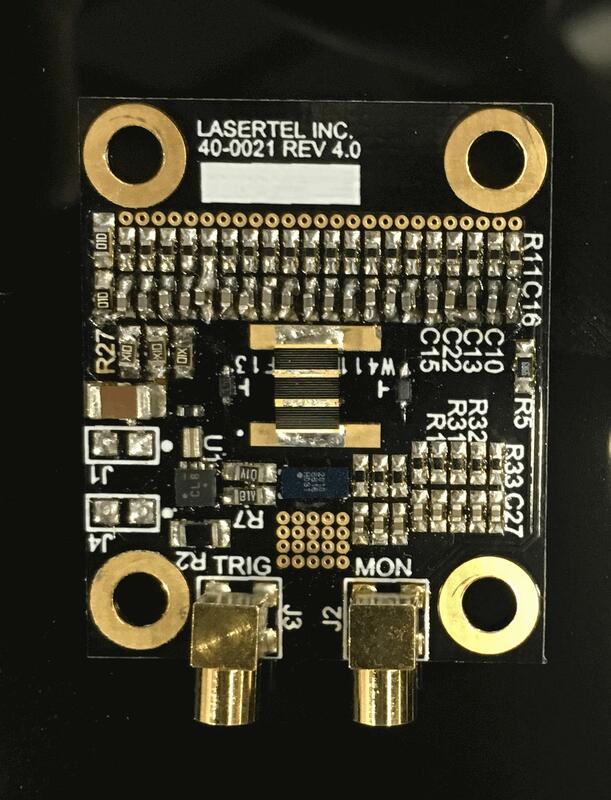 Photonics West gave the company a chance to show off its LiDAR Illuminator Module — a high-powered laser diode array integrated onto an OEM driver board, providing up to 10 kW in a 10 ns or shorter pulse. About 50 percent of Lasertel’s business comes from the defense industry, which has interest in LiDAR systems, as well. That demand is advantageous from a business model, Goings said, because it gives the company another viable market for which to develop its technology. However, Goings noted that defense applications typically operate over longer ranges — measured over kilometers, rather than hundreds of meters — and thus require more power. Fraunhofer IOF used the exhibition to promote its AR-plas2 antireflective coating, of interest to its partners in the autonomous driving space, most of which deal with LiDAR, and for whom IoF develops processes and technologies. A lens on display at Fraunhofer IOF's booth at Photonics West 2018. 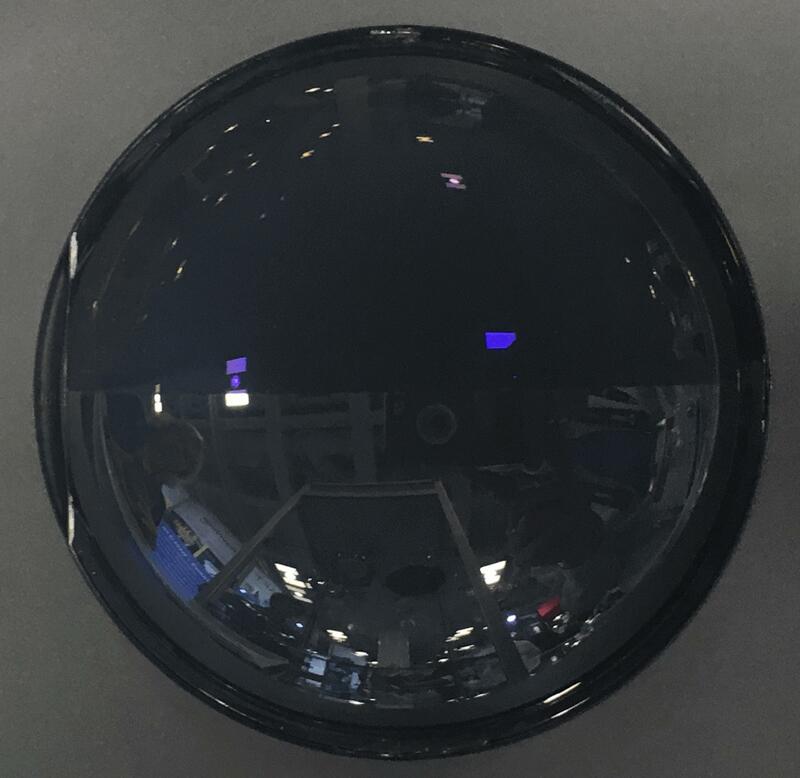 The top half of the lens has been treated with the Institute's AR-plas2 broadband antireflection coating. “We achieve very broadband anti-reflective qualities — from 300 to 1,700 nm. That’s very important if you think about hyperspectral imaging, or lenses where you have very high-curved surfaces or angles,” explained Dr. Kevin Füchsel, Head of Strategy / Marketing / Coordination for Fraunhofer IOF. The coating uses a low-temperature plasma process and a combination of inorganic layers and organic nanostructures. A refractive index lower than 1.1 on the outermost surface of the nanostructured coating guarantees a low residual reflectance for a broad range of light incidence angles, Füchsel said, and the technology is well suited for economic large-scale processes. Sabbir Rangwala formerly led the automotive LiDAR business at Princeton Lightwave, which was acquired by Argo.ai in October 2017. 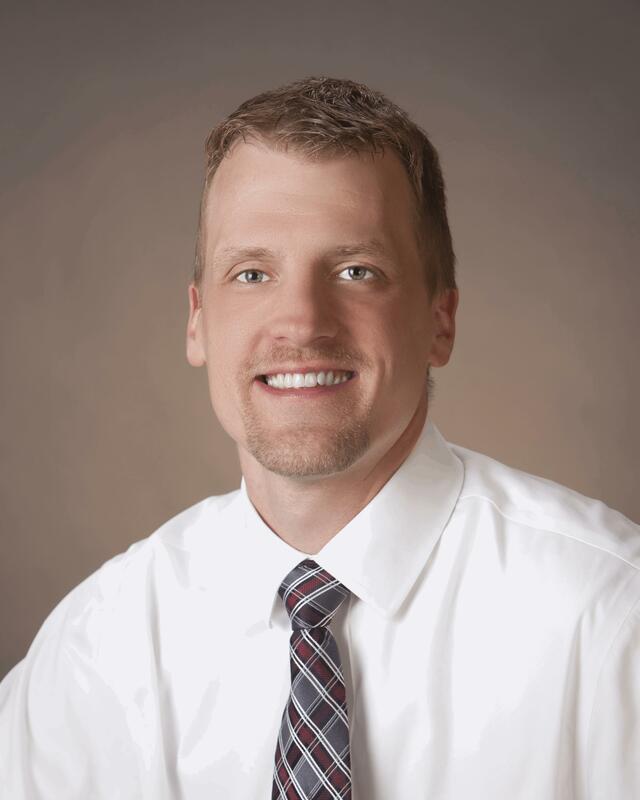 He currently serves as president of Patience Consulting, which advises automotive, shared transportation, and optics companies on autonomous vehicles and perception. Rangwala added that, while a number of panels and talks at the exhibition delved into silicon photonics, they focused mainly on traditional telecom and Datacom needs. “This is an area that could impact automotive LiDAR tremendously, but it needs a different strategic and business focus,” he said. Still, as Goings noted, autonomous mobility has big regulatory hurdles to overcome, while applications in telecommunications and factory automation do not. This increased attention and innovation in the optics and photonics components space is a boon to those who would see autonomous vehicles become commonplace sooner, rather than later. Luminar’s Eichenholz suggested power management as an additional area for component manufacturers to target, calling it “a huge issue with the customer [for sensing and autonomous driving systems].” A LiDAR system needs to be powerful enough to handle all of the data produced by an autonomous vehicle’s sensors, as well as “punch through” adverse conditions. “But, 70 to 90 percent of the cost of an optical component is packaging and test,” so, to meet the needs of the market, you have to get the packaging right, Eichenholz said. “You don’t want three-fourths of your power budget going to cooling,” versus the system itself. “Driving a vehicle on the open road is challenging for a human, let alone a piece of technology, especially in an urban environment. Autonomous vehicles deployed today are limited only by the LiDAR systems available,” Eichenholz said.